Palamedes PR, the B2B PR specialist, has secured more regional coverage for the Monmouthshire Business Awards. 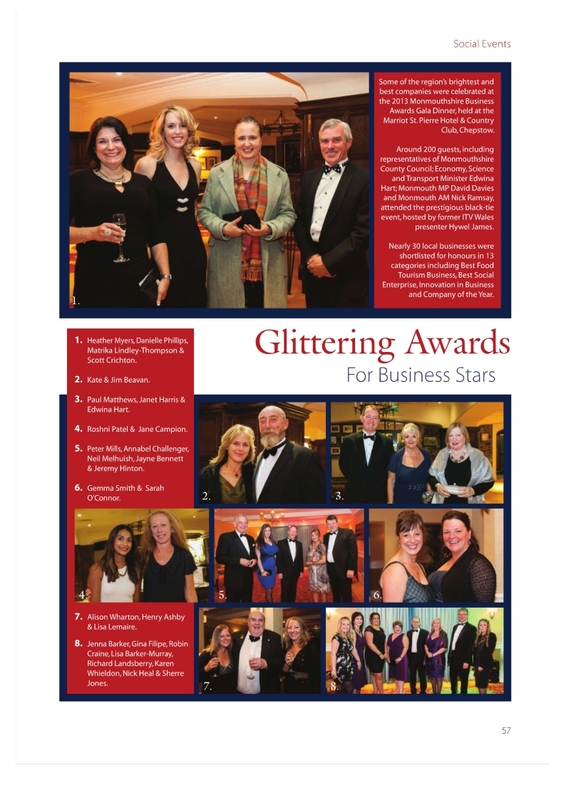 The MBA’s Gala Awards Ceremony, which was held at the exclusive Marriot St. Pierre Hotel & Country Club, Chepstow, is featured in the society section of the December edition of the Wye Valley Lifestyle Magazine. Almost 200 guests, including representatives of Monmouthshire County Council; Economy, Science and Transport Minister Edwina Hart; Monmouth MP David Davies and Monmouth AM Nick Ramsay, attended the prestigious black-tie event in October. The MBA Awards — dubbed the ‘Oscars’ of the Welsh business industry and backed by Monmouthshire County Council with support from Business Wales — recognise innovation, talent and enterprise in the wider local community. Following the record-breaking success of the 2013 awards, the MBA organisers have again appointed Palamedes PR to represent the event in 2014. Palamedes PR Campaigns Director Anthony Harvison said: “We are delighted to see this coverage in the Wye Valley Lifestyle Magazine. The awards evening was a fantastic night for all concerned and that is reflected in the photographs that have been published. Our coverage can be seen here or by clicking on the image above. black-tie event at the Marriot St. Pierre Hotel & Country Club, Chepstow, on October 11.